Infernal Stench:Can stink up an area that anyone without the constitution of a sewer worker will greatly desire to get away from. Possibly vomiting as they run. 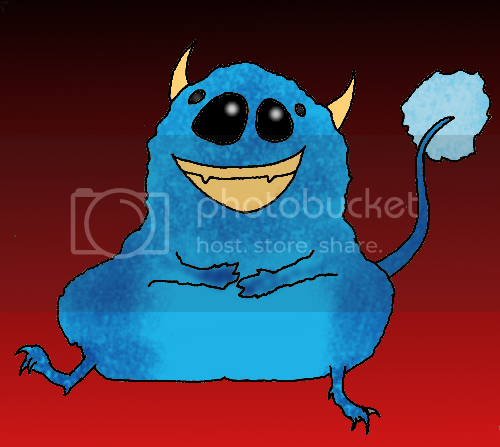 Has three forms: ugly-cute pug, blue blob with too many eyes, and malevolent blue haired teen incubus, another ugly-cute really, he’s kinda cute but very demonic. His abilities are form specific. Otherwise he’s mostly a mouthy little jerk. He must be summoned, unlike Hreb, who is pledged to Gaia, Garry has to be summoned for specific things, he can’t just hang out. It takes an hour long ritual that requires at least some skill and some kind of botch on the skill check means summoning some other demon. If he takes too much damage he poofs (stinkily) to Hell and must be resummoned. Frequently fails to understand non-demonic culture, but is aces at irritating people so much so that he obviously has some empathy, he’s just willing to use it for evil. Alignment: Chaoc evil light - He usually cannot be arsed to be really evil, but he’s not moral or nice like Hreb. They have been friends for half a millennium and despite their bickering are quite loyal to one another. Garry is kinda silly, and I will fully understand if he's not to your taste, just let me know and I'll extract him or just not bring him. He's a hoot to play, but not everone's cup of tea.